It’s time to tame the toughest job on the ballﬁeld. BY RED MULCAHY Special to Beacon Athletics — The tamp is a simple tool. Maybe that’s why nobody ever thought about improving it. But here at Beacon, we’ve spent our share of time pounding the ground with the standard 20-pound tamp. 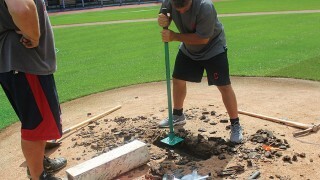 Felt the frustration of frequent mishits, as we worked around home plate, or the slope of the pitcher’s mound. Felt the jarring shock of the recoil in our hands, arms, shoulders. We’ve heard your complaints too, as we’ve traveled around the country visiting your ballﬁelds. Get the latest Beacon catalog! Covers all your ballfield needs. Request your copy today! 70lb capacity chalker is the biggest, baddest field liner there is. You have to try it to believe it. Interchangeable tamp heads give you up to 4 tamps in 1. 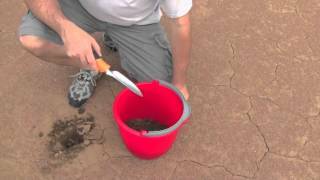 This how-to video demonstrates taking an infield soil sample for testing. In-stock items ship in 24 hours. Real, live experts. Real answers.